Years ago, when I was in active clinical practice, I saw that healthy eating can stabilize children’s energy, sharpen their minds and even out their moods. They had less acute illnesses like colds and flu and as they grew into their adult years they did much better than their contemporaries who continued to eat the western ‘white bread’ diet. Somewhere along the way chicken fingers, macaroni and cheese, grilled cheese sandwiches, hot dogs, burgers, French fries, ice cream and sodas became children’s staples. While they have been deemed ‘kid friendly,’ by fast food restaurants, these foods are often loaded with calories and offer growing bodies little nutritional value. As I had written in last week’s post on Children and Junk Food, while peer pressure and TV commercials for junk food can make getting kids to eat well seem impossible, there are steps parents can take to instill healthy eating habits without turning mealtimes into a battle zone. By encouraging healthy eating habits now, you can make a huge impact on your children’s lifelong relationship with food and give them the best opportunity to grow into healthy, confident adults. So many times, I have seen children who were given good foundational nutritional habits, return to better habits after a foray into junk foods as a teenager. Children (and we as adults) develop a natural preference for the foods that to them taste the best, so the challenge is to make healthy choices appealing. Of course, no matter how good your intentions, it’s always going to be difficult to convince your child that a bowl of fruit is as tasty as a sugar-laden cookie. 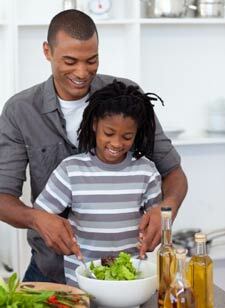 Make meal preparation a family affair. However, you can ensure that your children’s foods are as nutritious and wholesome as possible, even while allowing for some of their favorite treats. The trick is getting your kids to like healthier treats rather the commercial ones saturated in sugar, salt and fat. The childhood impulse to imitate is strong, so it’s important you act as a role model for your kids. It’s no good asking your child to eat healthier main courses and snacks consisting of fresh fruit and vegetables while you gorge on potato chips, chocolate bars, fast foods and soda. Children do notice the hypocrisy and have often told me that their parents’ message of ‘do as I say, not as I do’ was a turnoff to them to eat healthier. Natural whole grain breakfast cereal (without gluten and white sugar) available at health food stores and the health food sections of big chain grocery stores. Use almond or rice milk instead of cow’s milk or soy milk. Add some berries for variety. Bowl of fresh fruit sprinkled with whole grain granola. Fruit smoothie with mostly low sugar fruit and perhaps a little banana to sweeten. Add protein powder made from hemp and a little flax seed or hemp oil. Bowl of steel-cut oatmeal sweetened with fruit and a little stevia. Treats from the health food store or health food section of grocery store – veggie chips, organic chocolate bars, sodas. These are treats and need to be limited to 2 times a week at most. Desserts should be limited to 2 – 3 times per week maximum and should be as natural as possible, free of white sugar, white flour and dairy products. Try to make and purchase foods that are as natural and organic as possible when you can. Use natural and tasty sauces on salads and grains to make the foods palatable for your kids. Remember, the goal is not to be perfect, but to get children to eat more veggies and fruits. The above is only a guide, a target if you will. It is not meant to be rigid but an outline of a pretty good program. We all know that birthday parties and other social activities may intervene, but if the foundations of these suggestions are incorporated and understood by your children, they will help you help them. In my practice over many years helping parents and children modify the family diet, I found that if spoke to a child as I would to an adult instead of talking down to them, explaining the reasons why certain foods were necessary to keep healthy (and that if a healthier program was followed we could add treats), the child was often equally or even more cooperative than their parents in terms of compliance. That was my experience over many years of clinical practice.